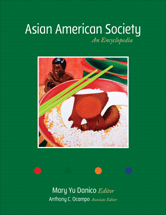 Asian American Society: An Encyclopedia provides a thorough introduction to the wide-ranging and fast-developing field of Asian American studies. The essays examine the social, cultural, psychological, economic, and political dimensions of the Asian American experience. 1895: Lem Moon Sing v. United States, et al. 1927: Gong Lum et al. v. Rice et al. 1948: Torao Takahashi v. Fish and Game Commission et al. 1980: Success of Asian Americans: Fact or Fiction? 2002: Empty Seats in a Lifeboat: Are There Problems with the U.S. Refugee Program?